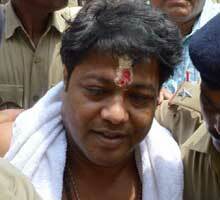 The Crime Branch (CB) on Friday arrested Sarat Patra, close aide of self-styled godman Sarathi Baba. And the investigating agency will produce him before the Kendrapara Sub-Divisional Judicial Magistrate (SDJM) Court on Saturday. Sarat Patra was summoned by the Crime Branch sleuths for interrogation on Friday. Following hours of grilling, the confidante of controversial spiritual guru Sarathi Baba was arrested here today. Based on the statements of two women victims, including the woman medico who accompanied Sarathi to Hyderabad. Patra was arrested under Sec 420, 384, 506 and 120(b). He used to allegedly force women to have physical relationship with Santosh Roul alias Srimad Sarathi. Notably, Sarat Patra, a school teacher in a High School in Mahanga area in Cuttack district, was placed under suspension by the School and Mass Education department on August 13 on charges of dereliction of duty. Patra was working as a Mathematics teacher at Mahanga Birbhadreswar High School. It was alleged that Patra was spending most of the time at the ashram instead at the school. Source said the Crime Branch would appeal to the court for three-day remand to extract truths about various illegal activities of Sarathi.